In what was yet another "high beta" quarterly earnings report for Twitter, shares of the social media giant plunged 7% in premarket trading after the company beat on top-line and bottom-line numbers, but disappointed investors with the revelation that its operating expenses would rise 20% over last year "as we support our existing priorities of health, conversation, revenue product and sales, and platform" while giving a disappointing sales guidance for Q1, with revenue expected at $715 million to $775 million in the period. It also reported tepid user-growth numbers. That the report was disappointing isn't much of a surprise; after all, Twitter had faced what BBG described as a "high bar" for its earnings report after Facebook and Snap posted surprisingly strong results. MAUs averaged 321 million during Q4, a drop of 9 million from the same period a year earlier, and down 5 million from Q3, marking the second straight quarterly decline as twitter cracks down on harassment and manipulation (last year it purged "locked" accounts suspected of being part of manipulation campaigns, warning that this could impact active user numbers). Following these disappointing results, Twitter revealed it would stop reporting active user numbers - seen as a key metric for investors - after Q1. 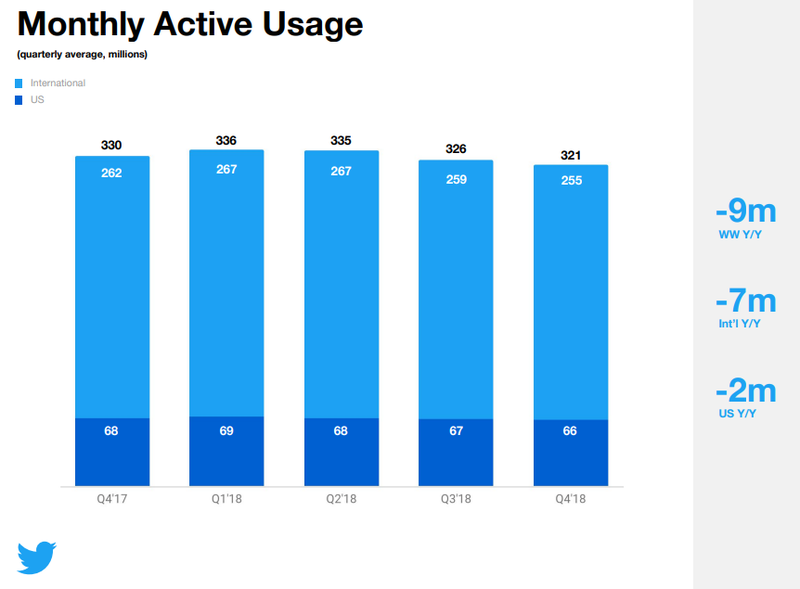 In its place, Twitter is pushing a new metric called Daily active users, which Twitter reported for the first time in Q4. That number increased 9% to 126 million. The company said its DAU metric captures only "monetizable" users, making it a superior metric to similar figures released by other social media companies, which include users who don't see advertisements. In what we imagine will be welcome news to Adam Schiff, Mark Warner, and other Russia-obsessed Congressional Democrats, Twitter said it has identified much less manipulation during the 2018 US midterms from bad-faith foreign actors than it did 2 years ago. Though the company recently disclosed that it had uncovered manipulation operations meant to mislead users that it said were connected to operators in Iran, Venezuela and Russia. 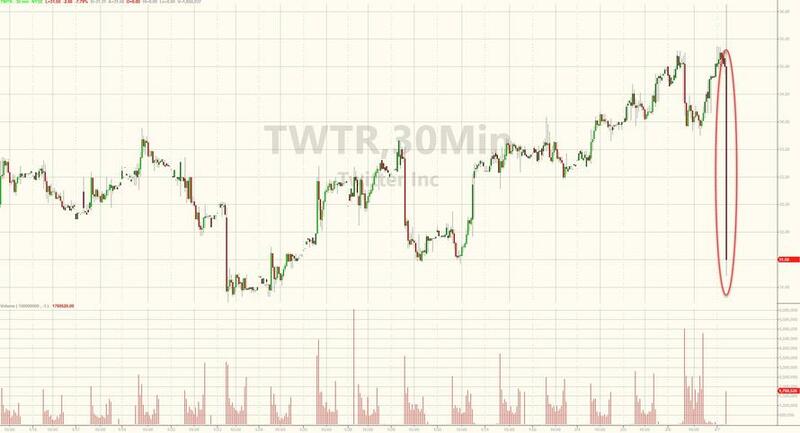 Twitter's sales increased 24% to $908.8 million, beating an average analyst estimate of $867.1 million. Profit came in at 31 cents a share, compared with an average estimate of 25 cents. The company said costs grew primarily because of hiring and expenses related to video content and infrastructure. The company increased its workforce by 16% in 2018, finishing the year with more than 3,900 employees. Q4 advertising revenue was $791M, (+23%). O&O advertising revenue was $749M, (+26%). Data licensing and other revenue came in at $117M (+35%). 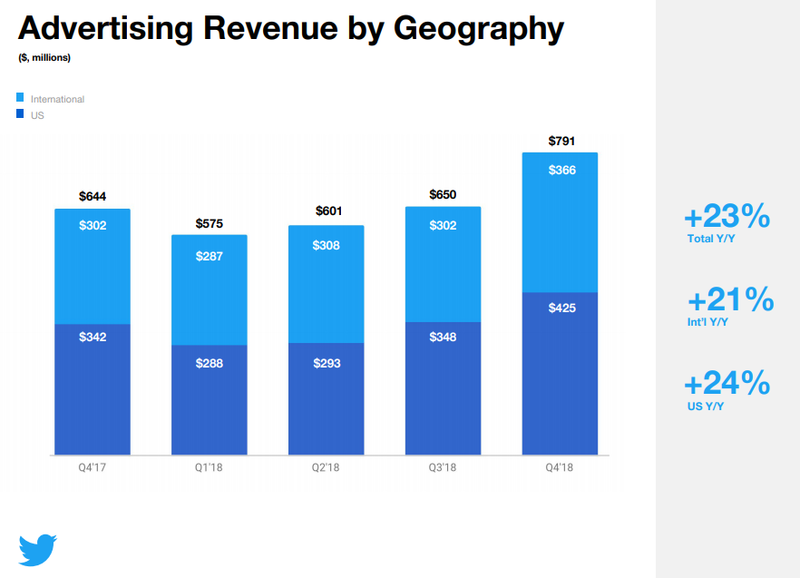 However, as Facebook and Google continue to expand their dominance of the digital advertising space, Twitter's share of that market is expected to shrink to 0.8% in 2019, down from 0.9% a year earlier.